BACKTRACK Armidale has never done things “by the book”, so it was with some relief that I found the organisation’s first art exhibition wasn’t by the book either. As I said when opening the exhibition “Wonksy Unleashed” last Friday evening, it was a unique event, even by BackTrack’s standards. 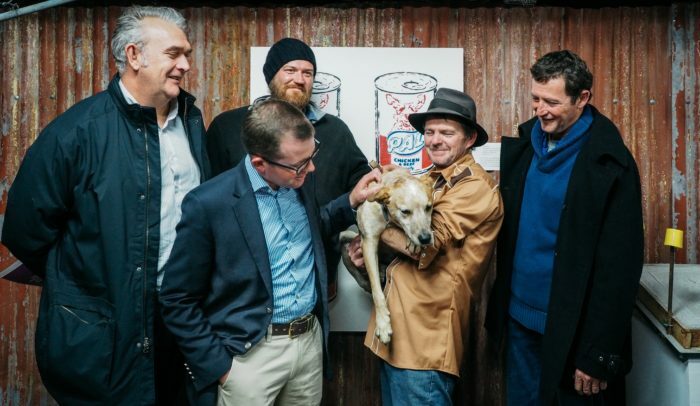 The artist was Wonksy the red cattle dog, who proved to have extraordinary talent – and I mean extraordinary – in ripping off reinterpreting icons of modern art. Wonksy’s efforts (sometimes with his tongue, using a special paint designed to encourage his interest in art) prompted those who captioned the works to reach new heights of expression. For instance, a framed piece of lawn (actual lawn) in which the artist had dug an (actual) hole, was titled “Lost Bones, 2016”, and came with the explanation that “the Artist’s perturbation surrounding the subject matter is expressed vividly in the emptiness of the hole, rendering his eschatological apprehensiveness palpable”. Behind all this artistic pretension-popping was a serious story, and serious purpose. Wonsky is owned by guitarist, songwriter and comedian Simon Mellor. He was discovered by Simon’s daughter, Eva, in the Armidale Shelter seven years ago. He had been involved in a bad accident: several teeth had been knocked out, he had a broken leg and a dislocated shoulder, and he had suffered some brain damage. Despite still being a bit lop-sided – hence his name – Wonksy proved to have star talent. He performs on stage with Simon, delighting audiences and scorning his disabilities. When Simon was performing for disabled children, Wonksy ad-libbed by falling off the stage before mingling with the children, to their great delight. The exhibition was mounted by Magic Electricity Box, a company Simon established with his partner Irene Lemon, an actor, to promote creativity in all its artistic forms. They believe that investment in creative activities is returned many fold for the well-being of people individually and our society as a whole. It is particularly effective in helping people deal with stress, anxiety and depression. Wonksy, the wonder dog, is joyfully symbolic of this phenomenon. The other great cause supported by the exhibition is BackTrack, a locally-born program that has proven uniquely effective in helping youths in difficulty. I’ve always been a big supporter of Back Track and the great team that makes it work, and it was terrific to see the Wonksy exhibition attract a cross-section of the community. Every young person who fails to find their way in society represents a personal tragedy and a social cost – sometimes a very high social cost. BackTrack has proved capable of turning around the stories of isolated youth to an unmatched degree – and dogs play a big role. It is really heartwarming to see that one formerly lost and damaged dog is helping lost and damaged kids get back on track.